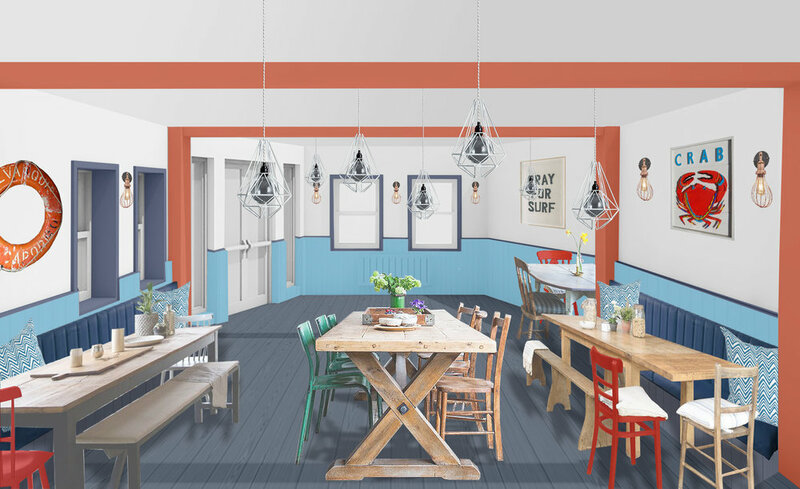 Brief: To update the dining room at The Old Success Inn. At present the dining room feels tired and lacks a cohesive design idea. The colour palette is very monochrome and the lighting is unflattering, this all combines to make the space feel slightly gloomy. Our design attempts to brighten up the space through a bolder use of colour and a more contemporary approach to lighting and furniture. Our inspiration for The Old Success Inn comes directly from the pub’s doorstep and the harbour at Sennen Cove. Providing a contemporary take on nautical, the colour palette references the bright bold colours and graphic lines on the fishing boats as well as their bold typography which we carry through in our choices of artwork.